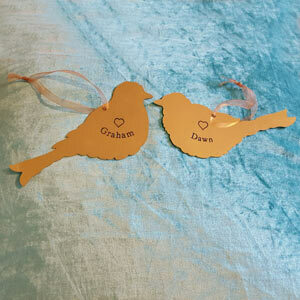 Have your names engraved into these brass bird plaques and express your love for all to see. 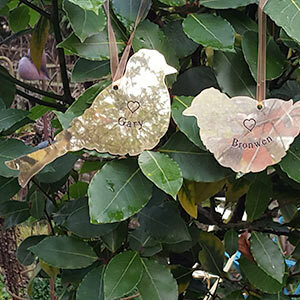 Deep engraved solid brass, suitable for use indoors or out, these plaques are a great love token. 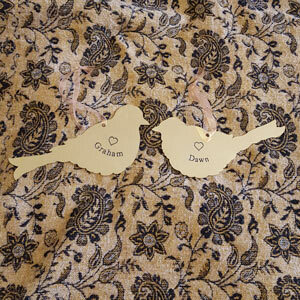 Suitable gift for weddings, Valentine's day, anniversaries, or to simply say 'I love you'. Deep engraved with a love heart and name, date or message. Price includes mainland UK delivery. Please enquire for overseas destinations. Unique designs by Bronwen Glazzard - you won't find these plaques available from anyone else. For accuracy please send the required text by email. We will then send a proof for your approval and payment can be made over the phone before we engrave.